Each year, millions of women across America proudly wear their distinctive pink ribbons for an entire month to raise public awareness of breast cancer, a disease that takes the lives of approximately 40,000 women annually. Yet, as the American public focuses on breast cancer, a silent killer is also taking the lives of nearly a half-million women in the United States each year. In fact, cardiovascular disease is, by far, the leading cause of death in the United States. Not just a disease of America’s aging population, a recent study from the American Journal of Cardiology cited that women ages 45 to 54 years of age have an almost equal risk of dying from cardiovascular disease as from breast cancer; currently, this risk alarmingly increases as women grow older. Of course, it should be noted that cardiovascular disease not only refers to heart disease, but also encompasses the risk of stroke. Stroke is the leading cause of disability in the United States and is responsible for almost 140,000 deaths annually, 60% of which are women. In fact, strokes are the third leading cause of death in American women. Studies have shown that the risk of having a stroke also varies by ethnicity. African-American females are statistically twice as likely to suffer a stroke as Caucasian women. Hispanic women’s risk of stroke is more than the risk to Caucasian women but less than the risk to African American women. In 2009, approximately 35% of people hospitalized for stroke were younger than 65 years of age. Although these statistics sound alarming, it is estimated that 80% are preventable. The major risk factors for having a stroke are high blood pressure, high cholesterol, and smoking – all of which are controllable. Other factors that can contribute to the risk of stroke include diabetes, lack of exercise and being overweight. Additionally, risk factors also exist that are unique to women, such as hormone replacement therapy, those who suffer with migraines, and oral contraceptives. Fortunately, over the past ten years, increasing numbers of women have become more aware of these sobering statistics, and have taken a more active role in their own healthcare. Since 2003, when the first National Wear Red Day took place, women have been fighting back through research and education. In fact, there has been a 34% decrease in the number of women dying from cardiovascular disease has been enjoyed. Female smoking rates have decreased and more are now getting into physical fitness programs. The upcoming National Wear Red Day takes place on February 6, 2015. 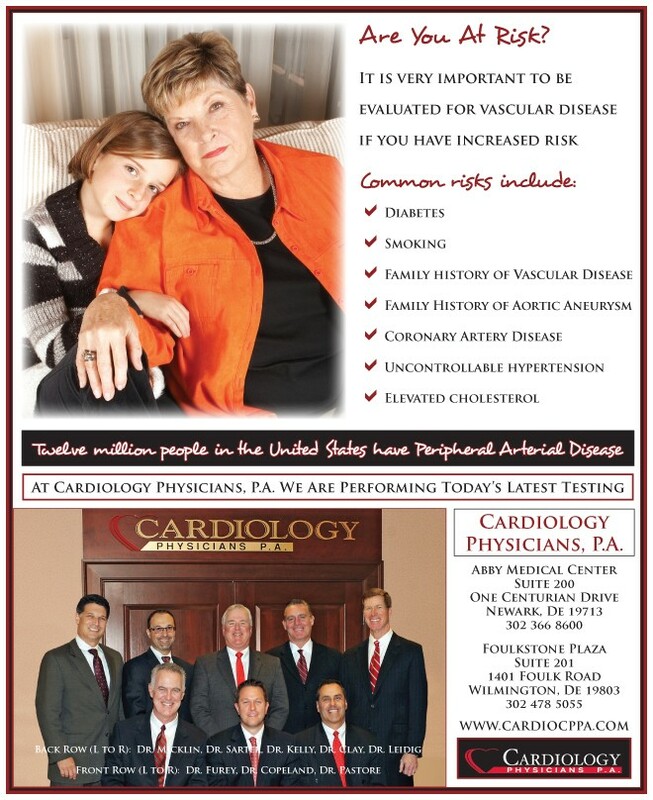 As awareness of cardiovascular disease risk grows, concerned women of the Delaware Valley will hopefully rise to the occasion and wear the color red proudly. Even more, may each one also reflect on their own healthy lifestyle choices, the health of other family members, and the healthy lifestyle of their friends in the ongoing battle against cardiovascular disease. ← Previous Story SENIOR CARE NOTES: Do You Know Where Your Loved One Is? Next Story → Red, Cracked Sore Corners Of The Mouth?